It’s been nearly seven months since my wife and I moved into our brand-new home, two states away from our hometown. The builders provided landscaping for the front yard; the backyard is up to us. The weeds seem resistant to chemicals, given they only seemed to grow more after two rounds of spraying. But weed I shall, and soon it will be time to make an actual backyard from dirt. The few contractors I’ve had come and size up my backyard gave estimates of at least $6,000. My wife is a high school English teacher and I’m a freelance writer. We just bought a house, so our funds are lacking. And thus began my goal to do the backyard myself and spend less than six grand doing it. Step one was planning. My wife and I mapped the fence lines and gave the measurements to my dad. He came back with a plan for the irrigation. Using pretty simple math based on the area the sprinklers covered, he figured out how many sprinkler heads and the length of piping we’d need. 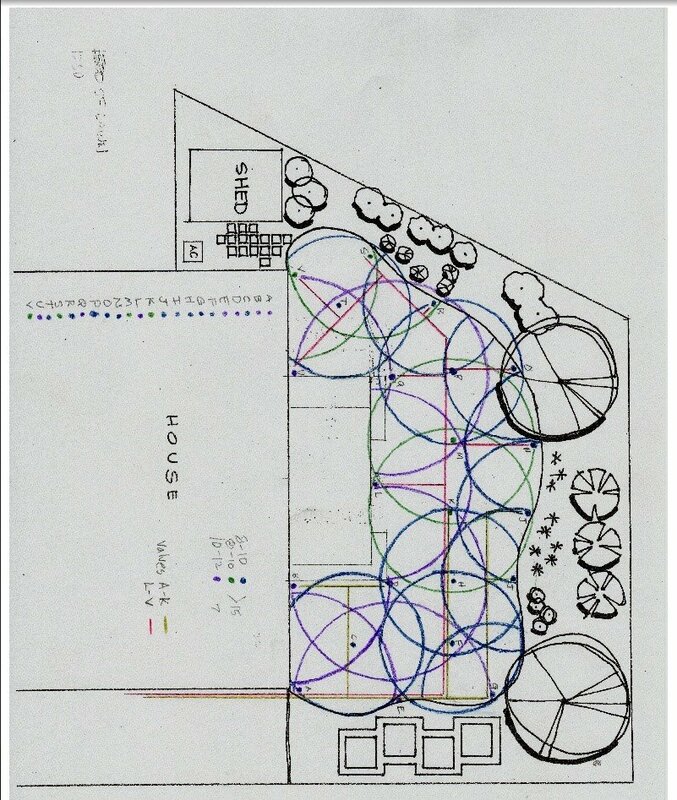 There’s four zones here; two drip zones for gardens and planters, two sprinkler zones for the lawn. With a plan mocked up and a parts list ready based off the plan, I started the whole process by calling in a favor. My cousin, a contractor, can get parts at wholesale from a local company. I shaved $200 off a normally $600 bill with my cousin’s account. The parts as they sit in my garage. My dad and uncle, that same cousin’s father, are going to help trench and lay down the irrigation piping in June. My uncle recently helped his other son put in an irrigation system, and my dad did it for his own house, so we have some idea of what we’re doing. There are still some parts I don’t have, but by my guess, I’ll have spent about $500 in parts. That’s not including dirt for grading or sod for the lawn. Installing sod costs an average of about $1,700. If I do it myself, it’ll be about $2,000, though I’m betting the site is probably wrong for my area. Even so, irrigation plus sod – let’s use the average from that site – brings me out to $2,200, or about a third of what the contractors wanted. The labor estimate for one contractor alone was about $3,000, so everything is looking pretty good so far. Now that it’s all planned out, and the parts are ready, the backyard itself needs to be ready. And that means getting rid of the weeds. It’s overgrown, as you will see below. I need to prepare the above-ground part of the yard before laying down sod. That means more weed killer – which I can get for about $10. Remember the two drip zones? I’ve already started planning out the garden for my wife. She loves using Pinterest to find DIY projects for me, and she came across how to make a raised garden bed for $12. Compared to Amazon, where a raised bed kit goes for a head-spinning $96. Assuming we decide on four, per the plan, that’s $48 instead of $384. The labor will likely be the same either way. Now, on to the fun part. The important parts of the backyard are set up, but now it needs to look the part. The easiest way to add flair will be in the north planter area. A simple pallet wooden path will take hardly any time at all, but break up the monotony of dirt and plants. This is literally as easy as ripping apart a pallet, and possibly treating the wood. Pallets can be bought as cheap as $10-20. A good wood stain can be $10-15. We’ll call this $35 total. Speaking of pallet wood, but getting a bit more hands-on, we have a garden loveseat. Though I currently lack a saw, everything else is fairly simple. Cut a template, making sure it’s comfortable, finish and seal the wood, and glue everything together. Bonus points for using the same finish as the wooden path, especially if the loveseat is near or even at the end of the path. Let’s say it takes me two pallets, but we can probably reuse the stain, so $40 total. While I was originally hunting for wine rack kits (which, if I had a saw, would be easy, if time-consuming, to make), I stumbled on an LED-backlit rack someone made from a kit. With treated wood, LED lights, and an acrylic sheet for backing, it should be pretty easy to hack the kit. This can be as simple as a Dremel and an LED, or as complex as using a laser or CNC machine with LED tape. An important note here – this would likely be seasonal or set up for parties, as fluctuating temperatures are not good for wine and liquor. Storing water bottles in the meantime, however, is definitely an option. This is likely to be the most expensive DIY project on the list. The kit used at the link is about $150, but I can probably get by with the $77 one. An LED tape strip is about $5. A thin acrylic sheet is about $6. I have a Dremel if I want to make some sort of engraving. In any case, let’s call this about $238. Another I-need-a-saw project, a farmhouse table for the patio. Though the project here is meant for indoor use, sealing the wood should work wonders for outdoors longevity. Making the table will cost about half of buying one. For ease of math, we’ll say this is an even $100 though the link claims less. My wife and I are looking to start a family this summer. That means I’ll want to figure out where to put a swing set. Commercial grade sets can be up to $4,000. DIY, I can make one for $300-400. It’s mostly wood, nails and labor, making this fairly easy to do. Downloading a kit is free, unless you count the cost of a few sheets of paper and ink. I’m cheating here, as hammocks tend to be hard to DIY. Just this once, I’ll buy the full end product itself. With a wide range of hammocks on the market, I’ll go with Mayan or Brazilian hammock. I want to be able to sleep in it during the weekends, but able to fit more than just me. The Mayan hammock is mostly made of cotton – meaning I’d need to keep it out of the elements when not in use – but they are often individually made. The Brazilian, on the other hand, is smaller, but can be made of polyester and left outside. The average is about $150. Now, bear in mind I don’t have some of the tools needed, but I bet some of my neighbors do. I also have to factor in the cost of beer for my dad and uncle. Even with that, I’m doing the backyard myself and with labor from relatives. I’m building a backyard, complete with decorations, for a little more than half what the contractors wanted – and I’d still be out more than $500 for decorations. Don’t even get me started on trees and the actual garden – but that’s another article. For now, I’ll be content in the money I’m about to save as I pull on my gloves to go take care of those weeds. My mother used to spend hours and hours laboring in the backyard. It was her favorite hobby. I can’t believe how expensive some of this stuff is but having a zen backyard is very important to me. Guess I better start saving!